Basically we see that the beamwidth is narrowing at high frequency, just as expected. I'm kinda stoked that the dipole radiation doesn't seem to be creating and weird lobes off axis, with the possible exception of a dip at 1khz. +/- 17 dB from 500 to 20kHz. Roughly omnidirectional below 2 kHz to -12 dB 45 degrees off axis at 10 kHz . Huge off axis dips around 1000, 1600, 3000. Around a 20 dB drop in the top octave. You are padding the HF around 4 dB, a bypass capacitor of around .25 or .5 mfd could bring back around 4 dB at 20 kHz. On my beamy Maltese horn, HF at output at 20K is equal to 10 kHz, even with 3" diaphragm drivers. Are the mid holes in the skinny horn killing the HF, or does the driver just lack HF? As already noted, the midranges are more efficient than the compression driver. This response has zero equalization. The entire crossover is one cap and two resistors. This is hardly what I would consider "finished." 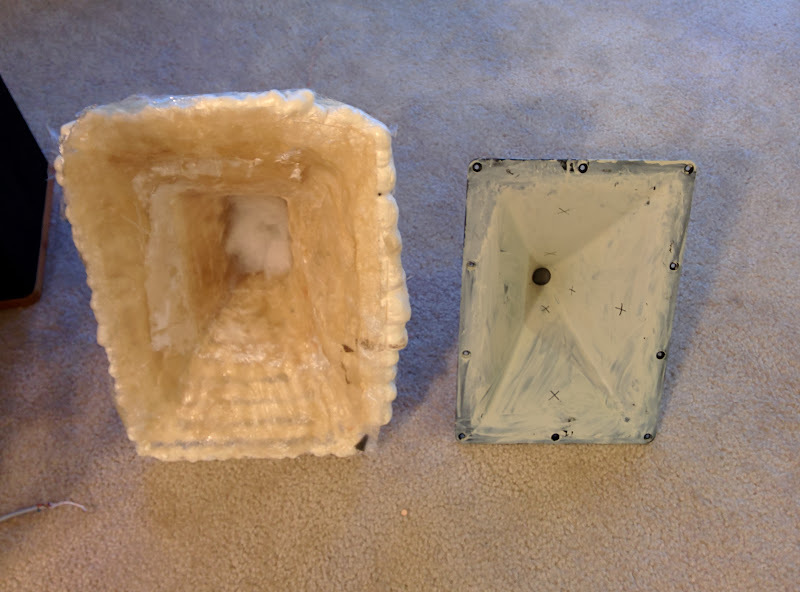 In this thread from four years ago (http://www.diyaudio.com/forums/multi...-fix-horn.html) I noticed that stuffing a crummy horn with polyfill made a much bigger difference than stuffing a good one. The QSC waveguide with polyfill barely had any attenuation; the USD horn had a LOT of atttenuation. Something like 10dB iirc. I'm seeing something similar with this LeCleach horn. When I fill the throat, I'm losing about five decibels of output at 20khz. That would seem to indicate that the midrange holes add HOMs. But the polyfill seems to nuke it pretty good. I'd say that this horn with polyfill and four midrange holes sounds 'smoother' than last weeks horn with no polyfill at all, and one hole. Another reason I'm losing HF is that the horn surface is really rough. As I continue to refine it I'll throw some bond on there to clean up the surface, but ATM, it's just unsanded fiberglass. BTW, all of my subjective comments are based on listening to the horn equalized. When I fill the throat, I'm losing about five decibels of output at 20khz. I'd say that this horn with polyfill and four midrange holes sounds 'smoother' than last weeks horn with no polyfill at all, and one hole. Unfortunately, EQ won't fix the axial response problems, which would be more visible with the response equalized on axis. Too bad stuffing the throat is needed to remove "brittleness" with this design, you have made it clear how much you like the top octave the polyfill eats up. How many bands of EQ are you using? Very nice work with the LeCleach horn! The sound of the horn on the video is actually very nice - can you post some jazz with sax and bass to see how that sounds? You are the master of prototyping with whatever it takes to get it to fit. I love the tube duct and PVC chamber approach you did for your car - although the time delay was big. In my sims I see that the "dip" near 1Khz can be reduced by placing the mid driver closer to the mouth - about halfway down the length of the main expansion. Can you please provide detailed dimensions of your LeCleach horn? I would like to try it in foam core with smooth bends. They blocked your video due to copyrighted material. Try posting an mp3 zip file as attachment to posts. Are you pulling it up from an iPad, a phone, or a PC? I can view it fine on my PC, but not from my phone. You need to make it available for mobile. I am using a phone at the moment. Art you seem to be critical of using a horn because it's beamwidth is narrower than what's used in the commercial Synergy horns, and because the beamwidth of a LeCleach horn isn't constant. Luckily, I have a pile of horns and a pile of compression drivers, so evaluating your criticisms is as simple as walking to the garage. 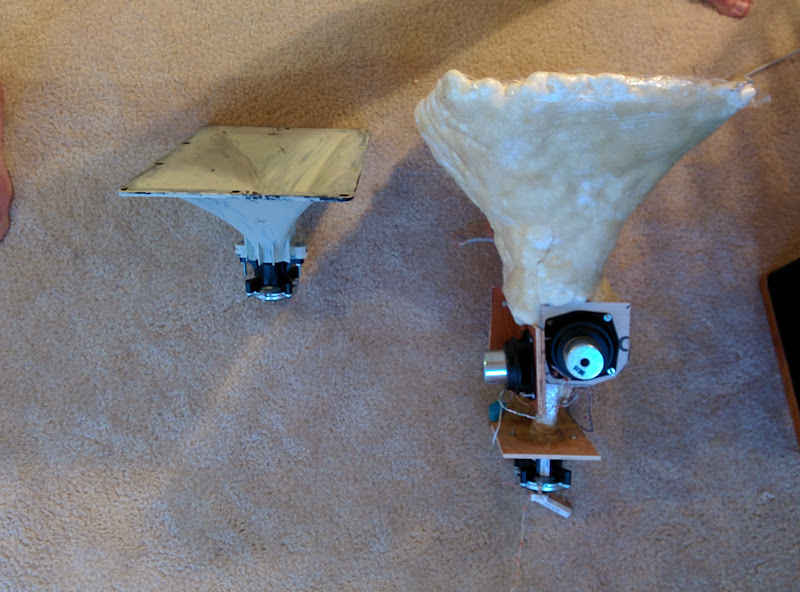 On the left is my LeCleach Synergy horn; on the right is a QSC 60x90 waveguide. $35 at Parts Express. Compression driver on both is identical, a Celestion CDX1-1425. But from the top, we can see that LeCleach is much, much deeper. If anyone's curious why the QSC is painted white, it's because I'd tried to scan it with a 3D scanner. My original plan was to simply use the QSC, but make it bigger to lower the cutoff. Figured I'd 3D scan it, scale it, then print it. Here's the LeCleach from last week, with one midrange, one hole that's 2cm in diameter, and a compression driver. Here's the response of the same compression driver, but on the QSC waveguide. Gotta admit, that looks pretty good. 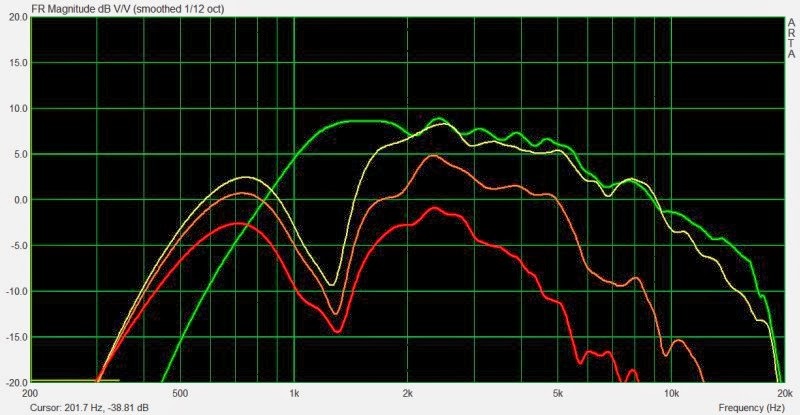 The LeCleach horn gives me 8dB more output at 750hz, and 12dB more output at 500hz, due to the greater depth. (The LeCleach is 30cm deep, and the flare rate at the mouth is about 400hz.) But the QSC waveguide is smaller, it's a part you can buy 'off the shelf', and since it's made in a factory the finish is perfect. All of which help with quality control, consistency, and high frequency output. 2) According to theory, LeCleach should have superior impulse response to conical or oblate spheroidal. This measurement seems to be consistent with that theory. The LeCleach isn't perfect, but it's closer to perfect. The image above shows what an 'ideal' impulse would look like. See how the LeCleach and the QSC look similar for the first millisecond or so, but then the QSC diverges from ideal behavior? I'm guessing this is because the LeCleach is designed to optimize the impulse response, and also because of the additional depth of the LeCleach. It would be interesting to compare a conical horn of the same depth to LeCleach, and you can do that in HornResp.